Skip the store-bought, pre-packaged graham cracker crusts and make your own! 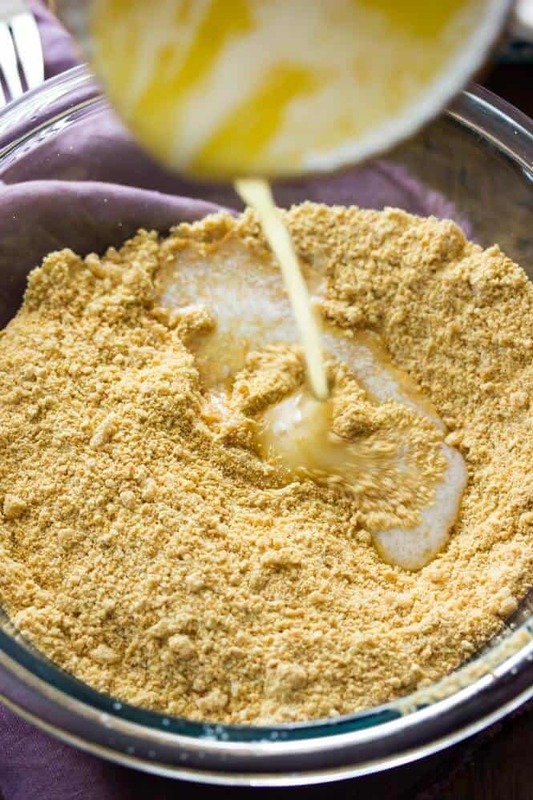 A good graham cracker crust takes only a few ingredients and several minutes to make, with this solid, simple recipe you’ll never need to buy a storebought crust again! I kind of understand the hesitation to make your own pie crust when it comes to traditional pastry crusts. 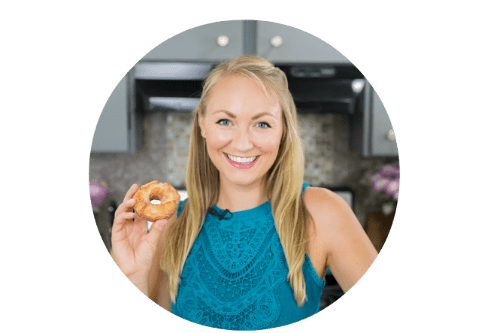 I know the frustration of trying to roll out a perfectly circular crust, of sprinkling flour over your whole counter-top to keep things from sticking, and the annoyance of cleaning up afterwards. I always opt to make my own crusts, but I can at least understand why someone might choose the pre-packaged variety. But when it comes to graham cracker crusts, I really feel that there’s no excuse to ever buy one from the store. 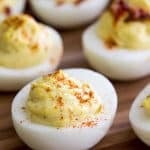 For one, they don’t taste nearly as good as one that you could make yourself, and secondly they are so supremely simple to make that it’s almost laughable. 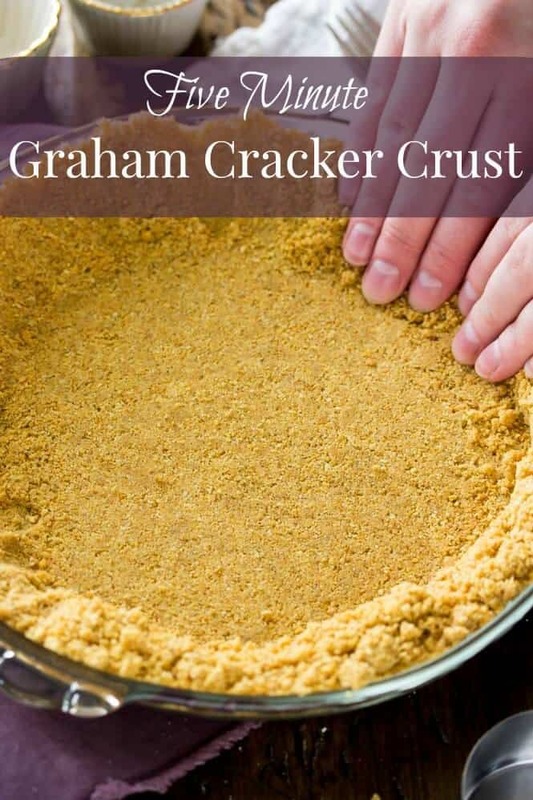 Today I want to walk through the simple steps to make your own graham cracker crust. 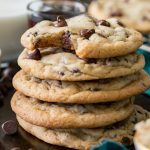 The whole process takes about five minutes, and once you have this recipe I have a feeling you’re going to avoid the storebought crusts from now on. We start with graham crackers, or pre-crumbled graham cracker crumbs. 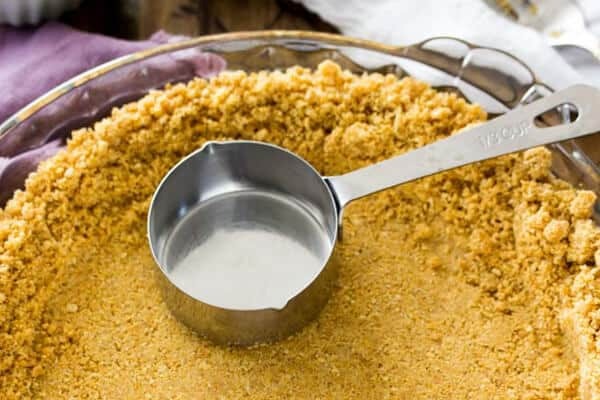 You’ll need approximately 10 graham cracker sheets, which translates to 1 1/2 cups of graham cracker crumbs. 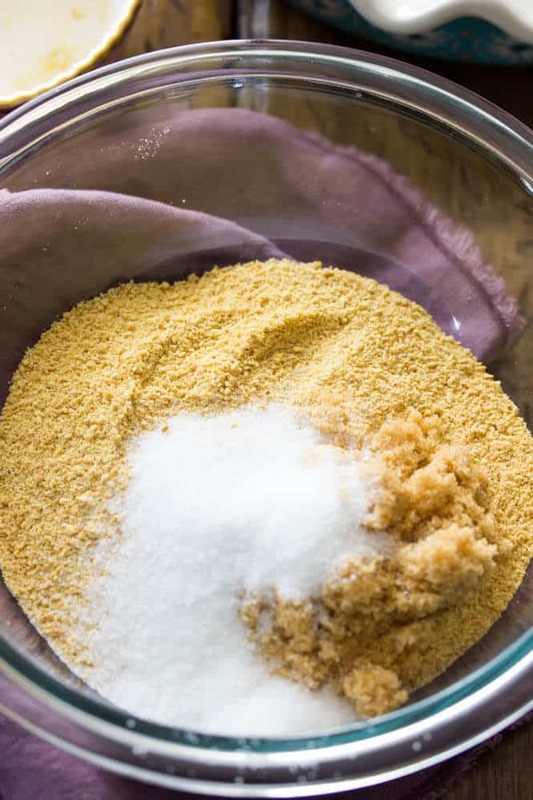 Add your sugar — I like to use a split of both white sugar and brown sugar, but you can use just one or the other if you would like. 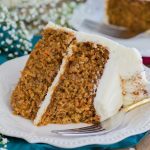 I feel that the brown sugar gives it a slightly richer flavor (something you don’t get from a semi-stale storebought crust!). Next comes the butter, which essentially acts as the glue that holds the whole crust together. Use a fork to toss everything together. I prefer to use a fork rather than a spoon or a spatula because it does a good job of evenly incorporating everything together. 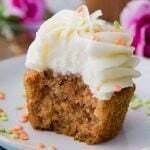 After a little bit of mixing, the crumb mixture should be well-combined and slightly damp. Now you’re ready to transfer everything to your pie plate. You can use a 9″ pie plate, which I used here, but this graham cracker crust recipe also works for cheesecake in a 9 or 10″ springform pan. Transfer your crumbs to your pie plate and press them tightly into the bottom of the pan. I like to use the (clean) bottom of one of my measuring cups to press the crumbs — it makes for a smooth, even surface. Finally, tend to the sides of the pie crust. 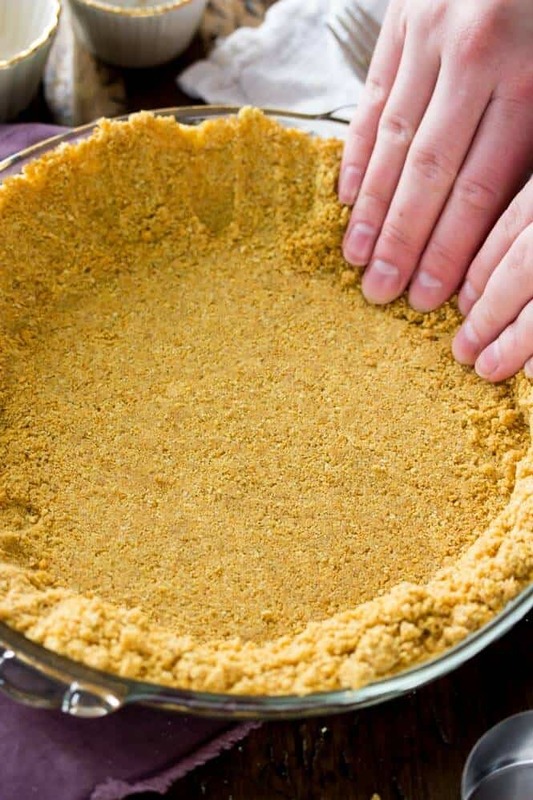 Use your fingers to press the crumbs firmly all around the sides of the pie pan. 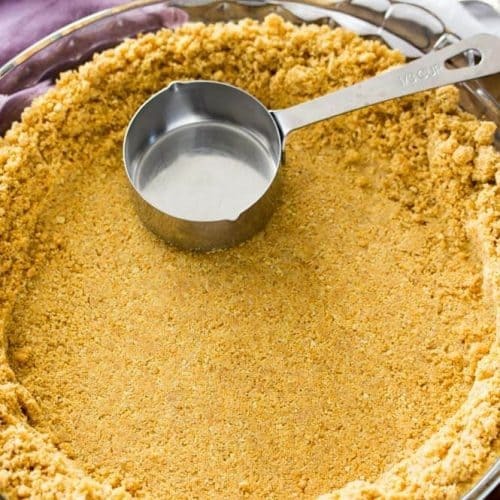 Your graham cracker crust will need to be baked in order to firm it up, that way when you cut into your pie the crust cuts nicely and doesn’t crumble. If your recipe is one that requires baking the pie, just follow the instructions in your recipe. 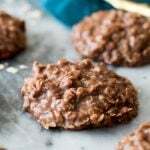 If it is for a no-bake recipe, then you can just slip it into the fridge or freezer for a few minutes before using. And that is it! 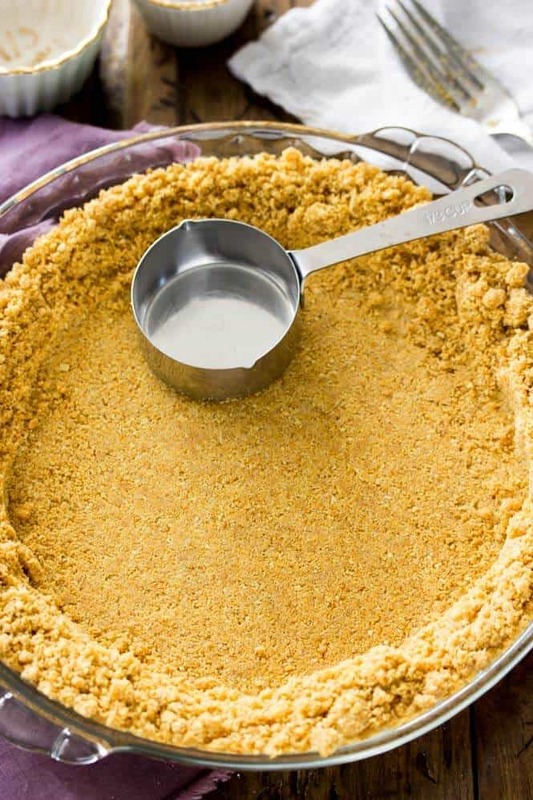 Just a few super simple steps to your own homemade graham cracker crust. 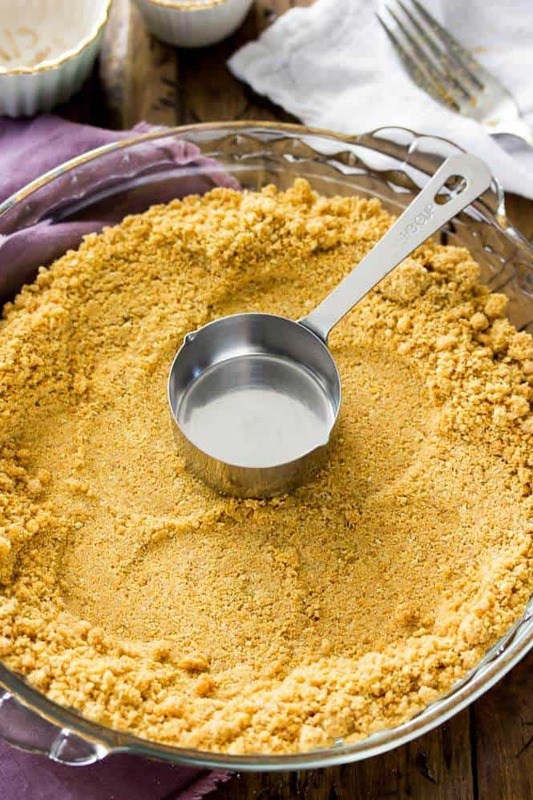 A simple graham cracker crust recipe that takes less than five minutes to mix together. 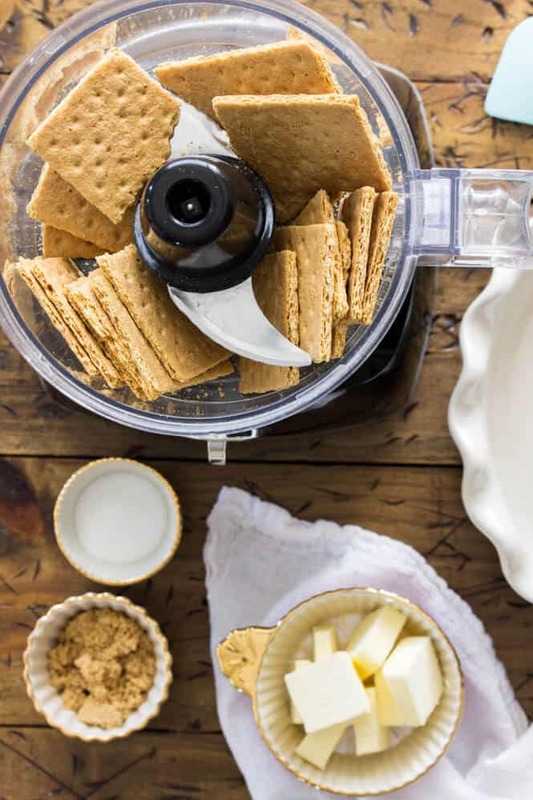 Pulverize graham crackers in food processor until finely ground into crumbs (skip this step if starting with graham cracker crumbs). 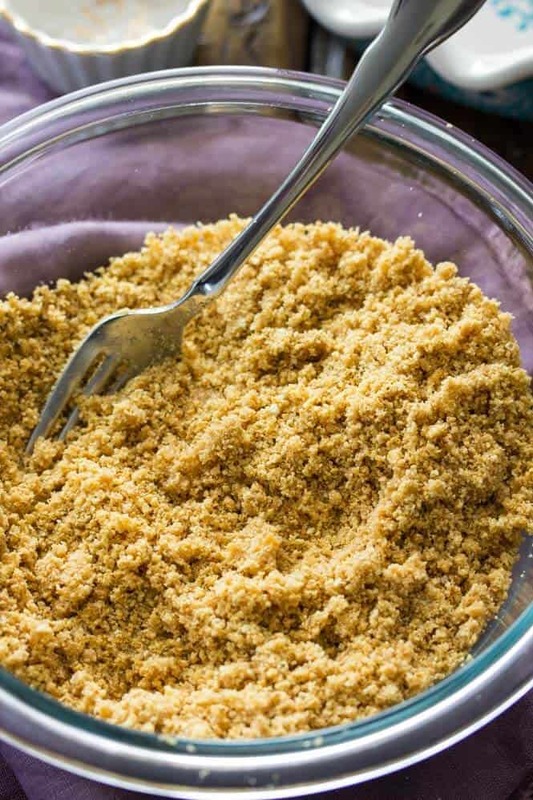 Combine graham cracker crumbs and sugars in a medium-sized bowl. Add melted butter and use a fork to combine ingredients well. Pour mixture into pie or springform pan. Use the (clean!) bottom of a measuring cup to firmly pack crumbs into the bottom of the pan and (if using a pie pan) gently press up the sides. 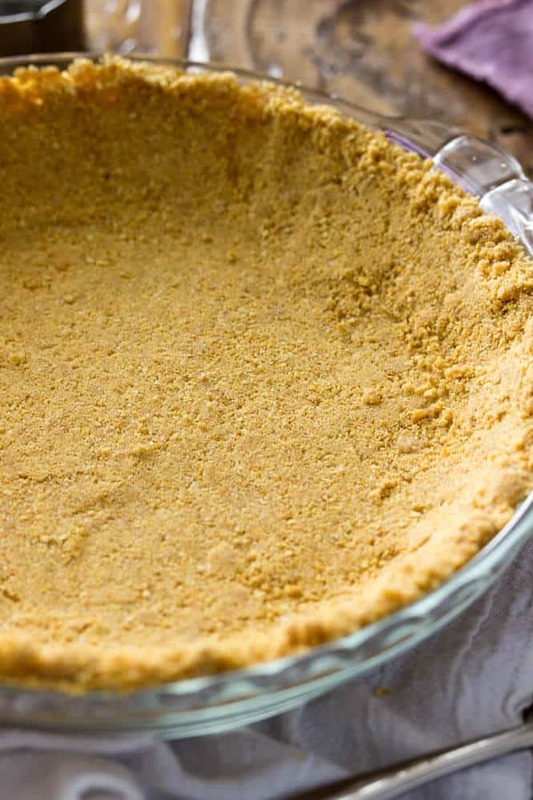 Use your fingers to pack crumbs tightly into the sides of the pie pan. If the crust needs to be pre-baked, bake on 375F for 7-10 minutes. 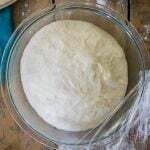 If using this crust as part of a different recipe, bake according to your recipe's instructions. 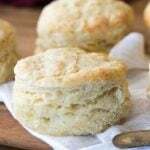 If this crust is for a no-bake recipe, refrigerate or freeze for 10-20 minutes before filling. You can just use white sugar if you do not have brown. 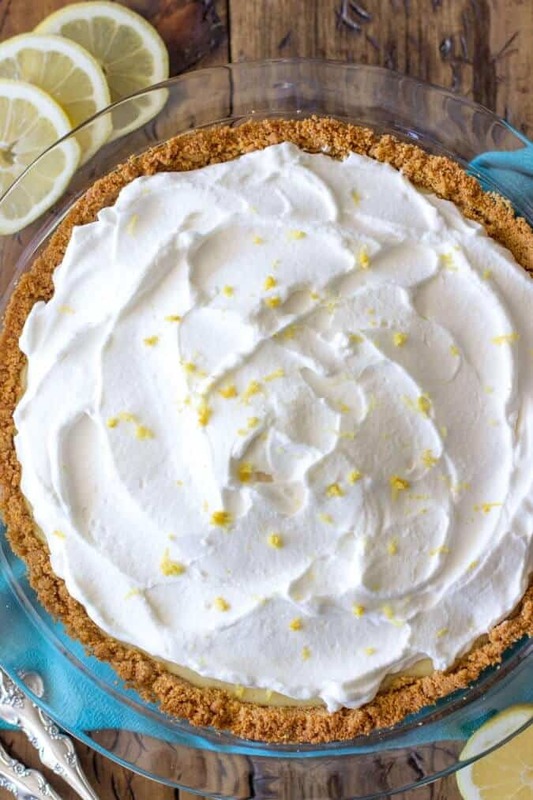 Now that you’ve made your pie crust, fill it with something good like this Lemon Cream Pie! how much grahams for a 13X9 pan for a graham crust? How much butter? How much sugar? Hi Bonnie, I haven’t done this in a 13×9 but I think you could increase the recipe by 50% and that should work. Enjoy! 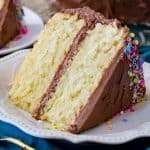 Hi Sam, I am going to be making 2 no bake cheesecakes for a dinner party I am having for 20 friends. But I am not a fan of Graham crackers or crust. I was going to change your receipe a little. One cheesecake is going to be plain with a shortbread pistachio nut crust. The other is going to be a chocolate swirl with a almond cookie crust. 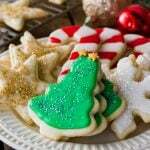 Since I am going to be using ground up cookies to make my crust do you think I should still add the sugar. Can I at chopped nuts? If they are chopped finely enough I think it would work. Enjoy! 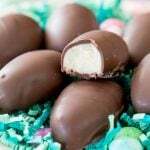 This recipe worked great for my millionaire pie I’m making for Christmas. I’ve made Graham cracker crusts before but never thought to use brown sugar. Also I had forgotten the ratios! Thanks for the help! Haha! I used it for millionaire pie also! I just came back to write the recipe down. My family loved it!